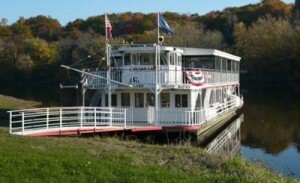 When you come for your cruise on the Grand Lady, you will board at Boynton’s Landing in Jenison, which was a stop for steamboats on the Grand beginning in the 1830’s up through the end of the steamboat era around 1910. Along the river you can still see the evidence of logging towns and riverboat landings that dotted the landscape of West Michigan in the 1800s. The Grand Lady is constructed in the style of steamboats that served the communities along the Grand River during the 1800’s. Although she is a modern vessel, she has many of the characteristics which made the early steam powered riverboats so successful on the Grand. With her shallow draft, the Grand Lady can operate along the full length of the lower Grand, from the Lakeshore Railroad Bridge at mile 37.7 in Grand Rapids, to the mouth of the river at Grand Haven, including Spring Lake. One of the main features of early riverboats was the giant paddlewheel. The Grand Lady has two identical stern paddlewheels, which may be operated independently. This allows her to be easily maneuvered in the narrow channels and sandbars of the river. The paddle wheels also allow her to operate in very shallow water (as little as 2½ feet), where a modern vessel would be grounded. Food and snacks is available onboard as well as live music and bar facilities. Both open cruises and charters are available. Typical events include parties, weddings, school groups, historic tours as well as a full schedule of open public cruises. The main cabin will seat up to 80 passengers and the upper deck has a seated capacity of 65. The upper deck can be reached by three staircases; two at the front of the main cabin and one at the stern. The lower deck, main cabin and restrooms are fully handicapped accessible and ramps are provided for boarding and debarking. Both decks and pilothouse are designed for Michigan’s unpredictable weather. With a cruising season from May 1st through October 31st, the Grand Lady can provide a comfortable experience, regardless of the season.